We’ve discussed the 2015 aluminum Ford F-150 a great deal, but the high-strength steel 2015 Chevrolet Silverado is an interesting piece of materials technology with ramifications for collision repair as well. High-strength steel can be more complicated to finagle thanks to the light, hard material’s properties. You can’t necessarily handle dents as you did in the past. Instead, General Motors’ solution, detailed in a Monday news release, is the remove-and-replace format that seems to be the future of collision repair as manufacturers move further away from mild steel to meet 2025 federal 54.5 mpg fleet rules. It’s already the answer to fixing parts of the F-150 and the carbon-fiber BMW i3. While remove-and-replace might irritate traditionalists who enjoyed the craft behind manipulating metals, automakers see it as the way to avoid the kind of long and costly repair sessions for consumers as seen in the infamous Edmunds F-150 report. On the other hand, if repair times stay somewhat comparable the trend could be welcome. If replacement advanced-materials parts can’t be cloned in the aftermarket, that means collision repairers can enjoy the higher margin of OEM parts as well as the quality they deliver to customers. You might be able to cut out a leading section of the frame instead of having to install another chassis, order a service section “shipped fully assembled” and weld it where the damaged one was, according to GM. 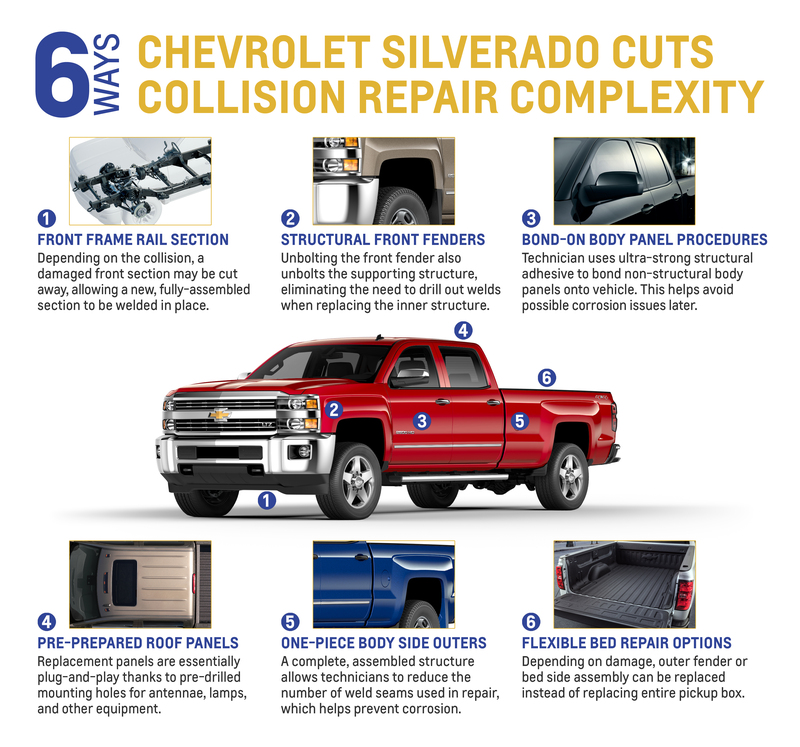 “Because of the way Silverado’s front frame rails are engineered, minor impacts don’t necessarily equate to substantial repair bills,” GM wrote in the news release. 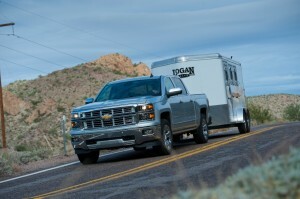 Unlike other vehicles where the fender is made of an “outer skin” and an interior structure connected to the cab you’d have to drill out, the 2015 Silverado allows technicians to unbolt the whole thing, GM wrote. Any non-structural body panel, including those for the outer roof and doors, can be removed and a new one bonded into place with an “ultra-strong structural adhesive,” according to GM. “This helps avoid welding and possible corrosion issues later while speeding the repair,” GM wrote. You can order roof panels already prepared with studs and accessory holes “that essentially plug-and-play,” according to GM. You can get a “single, complete assembly” of a body side outer shipped to your shop from GM so technicians can cut away a damaged portion and replace it, the automaker wrote. “Our goal is to only have weld seams where we absolutely need them,” Szlachta said in a statement. Damaging a Silverado bed or bedside doesn’t always mean you have to buy a new truck box. “Depending on the damage, the outer bedside or the bedside assembly can be replaced from the bed floor out,” GM said.